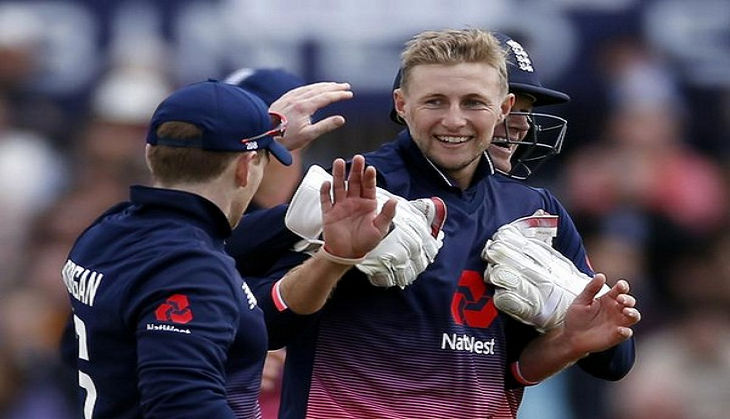 Joe Root is confident that he could repay his England's faith and contribute with the ball is he is asked to perform as a second spinner during the forthcoming Champions Trophy beginning June 1 in UK. Root, who is regarded as one of the most proficient batsmen in the present era, has admitted his love for bowling, saying the thrill of taking wickets is much better than scoring runs. Root, England's number three in a one-day international team captained by Eoin Morgan, was among the runs during the recently concluded two-match ODI series against Ireland, making an unbeaten 49 at Bristol and 73 at Lord's as Eoin Morgan's team wrapped up a comprehensive 2-0 win. However, it was his contribution with the ball during those matches that really stood out. He took five wickets across the two matches, including an ODI best three for 52 in Sunday's encounter. Morgan's decision to play just one frontline spinner in Adil Rashid offered the part-time off-spinner more opportunities to bowl and at Lord's he got through 10 overs in an ODI for the first time. "It's so much better than scoring runs!" Sport24 quoted Root as saying. "I can see why some of the bowlers get so excited at times, because it's great fun," he added. The Champions Trophy hosts have three more ODIs against South Africa ahead of the marquee event and the powerful batting line-up of the Proteas could prove an acid test of Root's usefulness as a 'part-time' bowler. "We have so many options and such depth within the squad," Root said. "If I can play that role, I hope that gives us a bit more strength in other departments if need be." The part time off-spinner has taken 18 ODI wickets, with his victims listing New Zealand's Kane Williamson, Pakistan's Mohammad Hafeez and the Australian pair of Michael Clarke and David Warner. However, the right-handed batsman doesn't like himself to be classified as a fully-fledged all-rounder. "I suppose it's just if I'm required... and if someone doesn't get hold of me as well! A few things that I tried worked - and I hope I can continue to develop those variations, as small as they might be, and still be effective," he said. "A big part of my bowling is the mental side of it, trying to work out the conditions, the batters, the risk-reward in what might work in terms of field placings - and see if they'll take a gamble against me," he added. England squad for Champions Trophy: Eoin Morgan (captain), Moeen Ali, Jonny Bairstow, Jake Ball, Sam Billings, Jos Buttler, Alex Hales, Liam Plunkett, Adil Rashid, Joe Root, Jason Roy, Ben Stokes, David Willey, Chris Woakes and Mark Wood.